Red Fang drank a lot and made a great music video — and they got signed because of it. "The puke is real. … We drank so much that day.” John Sherman, the drummer in the Portland rock band Red Fang, is talking about barfing during the shoot for the band’s “Prehistoric Dog” video — which, after going viral and gaining more than 200,000 views on YouTube, had a hand in the band being signed to Relapse Records. If you haven’t seen the video, watch it (below). The four-piece wages war on a group of LARPers in wizard costumes, all the while chugging beer after beer after beer after … actually, if you have any tinge of a hangover, it’s best to wait on watching it. Because at one point — out of the blue — Sherman and guitarist Brian Giles hurl side by side on a coffee table. “Brian was the first one to puke,” he says, recounting that the guitarist had stepped outside to get sick. “[The director] was like, ‘What’s he doing? If you’re going to puke, you’re doing it on camera.’” But because they did puke on camera, fight with nerds in medieval garb and build Monty Python-esque costumes out of spent beer cans, hundreds of thousands more people — people who might never have given Red Fang a second look — heard the band. Sherman says the video has been more of a blessing than a curse, but he admits that he’s sick of answering questions about it. In part because of the video’s viral nature, the band found themselves inking a record deal with well-known metal label Relapse back in September and landing slots on the Rockstar Energy Drink Mayhem Festival and the Mecca of metal festivals, France’s Hellfest. For four guys who’ve been playing in bands for most of their adult lives, the deal confirmed the strategy that has driven them since formed in 2005. Essentially: Play hard, play what you like. When they formed the band, they wanted to strip away any complications. Sherman says they didn’t want to be being technical simply for technicality’s sake. Time. It wasn’t straightforward stuff at all,” he says. “[It was, like] spin the wheel of tricks and jam as many cool licks into one song as possible. “When we got kind of back together and brought Aaron in, we were, like, ‘Let’s dumb it down. Let’s not worry so much.’” In Red Fang, the band concentrates more on refining one riff, then letting that carry a song into the distance. On their new album (Murder the Mountains, released last week on Relapse), the band is heavy but hardly divisive. That’s partially because they recorded with Chris Funk of the Decemberists. 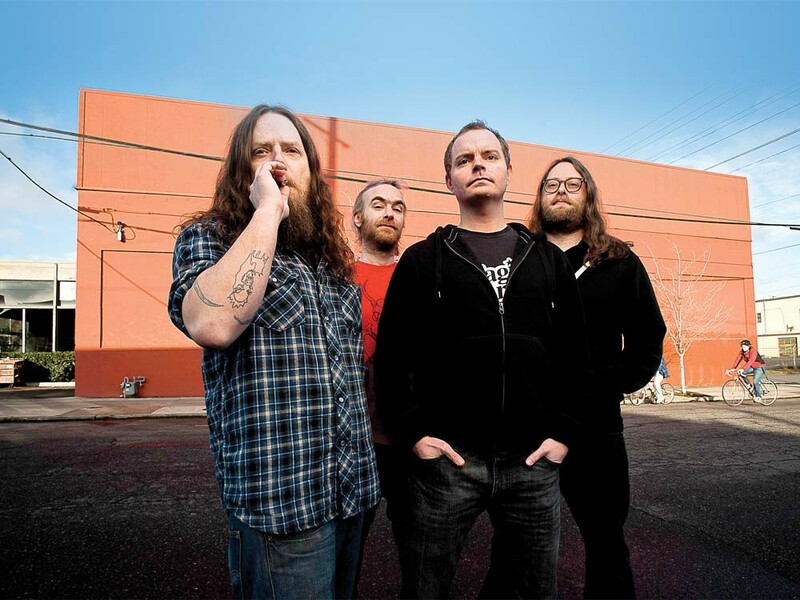 Never too slow to be called sludge, never too fast to be thrash, Red Fang carves out their own sound: one you can rock out to, and one you can absolutely drink to.